Balancing Jane: Making Decisions about the Rest of Your Life? Relax! Making Decisions about the Rest of Your Life? Relax! As I've mentioned, my full-time job is to coordinate a program that helps underrepresented students get into graduate school. And--as any of you with experience in higher ed know--this is the time for graduate application freak outs. It wasn't that long ago for me that I had sat on the edge of that cliff, looking out into the unknown. Where would I live? What would I become? What would it cost? Will my friends still be my friends if I move away? What will I miss? What will I gain? Today, a student came to my office distressed over her attempts to choose between two possible fields in graduate studies. I'm not making light of her decision; it is a big one, and it does matter. Just not quite as much as it seems. See, Robert Frost was acting very much the way my graduating seniors are acting (and the way we all tend to act when faced with a big decision). We examine our options and then "look down one as far as we can," but that's never far enough. We might be able to see that a decision to medical school means a more definite career path with more debt while a decision for a PhD in biology means less debt and more uncertainty, but we can't figure out what happens after that because it hasn't happened yet. And, the truth is, choosing a graduate school (or whether or not to move to a new city, or whatever it is you're deciding) is a choice that shapes us, but it's not a choice that necessarily determines us. We are more than the logical conclusion of a single choice (or even a series of big decisions). We are individuals shaped by a series of experiences large and small, within our control and outside of it, good and bad. I think of it like a float trip (for those of you who live in cities where there are exciting things to do and so you do not have to spend your summer weekends floating down rivers on inflated rafts, well, I'm sorry that you're missing out on important metaphorical experiences). See, on float trips, there are often divergent paths in the river. They often bend, and just like Frost's infamous paths, we can't see the end of either one, so we have to make a choice. It's often a rapid choice, made by a combination of whimsy, following (or defying) the flow of the river, determining which one looks safer (and whether or not it's danger we crave), and how many drinks we have had. If we choose the one on the left, we might be in for a rough ride. We may get scratched up by the low-lying limbs on either side of the current. We may hit a patch of rapids and get spun around, getting passed by two guys blaring AC/DC from their canoe, landing with a thud on top of a sunken tree trunk, electing the most sober among the crew to sacrifice by diving back in and swim while pulling us to safety. If we choose the one on the right, we might be in for a slower trip. We may casually follow the flow of a lazy river through a shallow bend. We might get stuck on the rocks that protrude ever so slightly from the top of the water, forcing everyone in the boat to get out, wade ankle-deep and pull and then--without an ounce of grace--flop back into the raft before it floats away unmanned. And we might have to do it all while the other four or five rafts that chose this path bump into us. But do you know what happens at the end? The paths merge. We all end up at the pick-up point. That's not to say that it doesn't matter which one you choose. 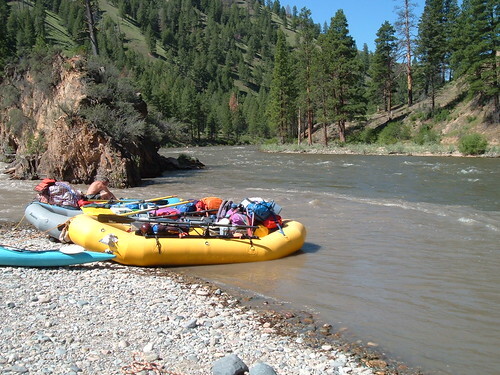 See, a float trip is less about the actual trip and more about the memories and stories you collect and share. You only get one path's worth of memories and stories. You can't have them both. And even if you went back and traveled the other way the next time, it wouldn't be the same. I believe that our lives are too complex to be determined by one choice, but that doesn't mean those decisions don't shape us. When my student makes a decision about which field she will study in graduate school, she will choose which lens she will use to view her future profession and her future research. That doesn't mean, however, that she has to cut herself off from all of the possibilities of how her two interests combine. She can end up in the same place--a scholar with multiple interests--with a slightly different story to tell.